I love this book! (I know, I always say that, but if I didn’t love them they wouldn’t be on here. ) 🙂 Why do I love this book? It rhymes and it has repetition which are awesome qualities to have in a book for getting kids ready to read and rhyming and repetition can make a book super fun to read, too. I also love it because the story gives kids a sense of where they are in the world…from the universe, to their country, to their street to their own bedroom. They are their “own little piece of the universe”. I really like the illustrations in this book, too. I don’t know how to explain them, but the only word I can come up with is “retro”. I know, not very descriptive, but they definitely add a certain special something to the book. Rarely do I ever recommend a book based just on the illustrations alone, but this is one of those times. Our youngest opened this book, took one look at the illustrations and said “wow” while touching the pages to try and feel them. I don’t know how the illustrator created these pages, but they are shiny in a way that’s not glittery or shimmery. 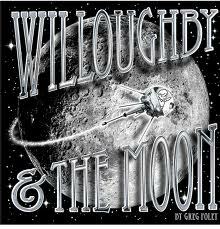 They go along nicely with the story of Willoughby and his trip to the moon. This was not a book I instantly fell in live with, but it grew on me. This book has sort of a magical feel…I think it’s the illustrations. 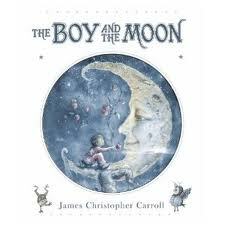 In this story the moon gets stuck in a tree and although his animal friends are unable to help, the boy climbs the tree and comes up with an ingenious way to get the moon unstuck. An adorable story about how aliens steal underpants from the clothesline. What child doesn’t think underwear is funny? Add that to some very endearing and curious aliens with a cute rhyming story and you will definitely get a chuckle or two. Mickey Moonbeam is very excited to meet his penpal Quiggle. Quiggle is supposed to come to Mickey’s house for the very first time when his space scooter crashes on a nearby asteroid on the way to Mickey’s house. Mickey rushes off to save him but can’t seem to find him. The two do finally find each other and quickly realize that the other looks a lot different than the other imagined. Their differences come in handy though when they use teamwork to fix Quiggle’s scooter and finally get to enjoy their time together. When I had posted on Facebook that I was going to be sharing some books about space, one of my former colleagues suggested Moonshot. I read it to my youngest today. Wow! What a great piece of non-fiction for kids. It takes the reader through the astronauts getting ready in their spacesuits and getting into the ship. It shows how mission control plays a part on the lift off as well as how people on the ground are watching and waiting. The book also talks briefly about the practical things the astronauts have to deal with while living in space like eating, sleeping and going to the bathroom without gravity. The landing on the moon is covered from both the perspective of the astronauts as well as from those glued to their TV sets on Earth. The illustrations are fantastic, too. Two thumbs up! Wilma is minding her own business chasing a fly around the pond for breakfast when she accidentally gets sucked up into an alien spacecraft. The aliens on board think that Wilma is their child but that she must be terribly sick and that’s why she looks so different. Her alien “mother” puts her to bed to get better, but that doesn’t last too long…soon Wilma is up and hopping around. She ends up hopping across the flight controls which sends the ship in a nosedive and straight back to Earth. A great introduction to the planets, the sun and the moon with brief facts about each one as well as a glossary in the back. The book not only gives children information about their own solar system, but leaves them wondering about what else might be out there. Another planet like Earth? Another someone like them? A fun counting (backwards) book that leads children through the process of what it takes to get the astronauts into their rocket ship and blasting off. The book also has a fun number find built into the book. On each page there is a number hidden in the illustrations. 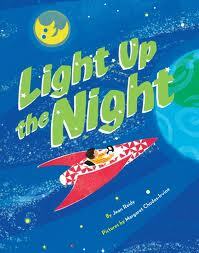 A great introduction into the world of space exploration and a fun way to introduce or practice counting backwards. Stella’s dad is trying to get her to get ready for bed, but she has bigger and better plans. She does eventually get ready for bed, but not before she takes a little detour through the solar system in her chicken rocket, bounces around in some craters and finds some alien bugs on a distant planet. Maybe she will take her dad with her next time if she can get him to stay up late enough.